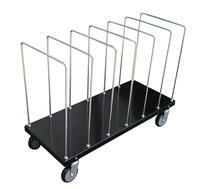 Portable steel cart is designed to store, organize and transport your empty cardboard boxes. Chrome plated uprights and frame dividers with powder coated black shelves. Ships knockdown. Model V-CTC-1856-B (Pic. 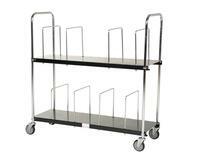 1) feature two adjustable-height shelves with adjustable box dividers ideal for oversized boxes. Four swivel casters for easy maneuverability are standard.